As I meet with executives and senior managers, they increasingly want to discuss the returns that their organization is receiving from compensation. They are looking less at employee compensation as a cost and more as an investment. They pose the question: What is our return on investment from compensation? The first step in deciding the impact of compensation is to develop a compensation strategy. This month’s Compensation Alert will discuss the importance of a compensation strategy. Next month we will address how to develop a strategy. What does an organization want its compensation programs to accomplish? Compensation strategy is the answer to the last question. Strategy is a statement of what we want compensation programs to accomplish. 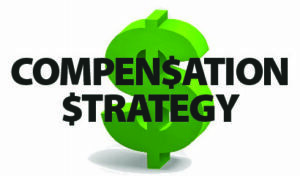 Compensation strategy is part of a company’s human resource strategy. External factors such as trends in supply and demand for talent, customers, markets, challenges and business opportunities affect where an organization is. Internal factors such as core competencies, values, culture, strategic initiatives, and skills of current employees additionally affect strategy. Program objectives: what is the organization trying to achieve? What will the organization pay for? For instance, how important is pay for performance? What markets are being used to compare the company? What type of business, geography, size of organization, competitors? How competitively should the organization pay: median, above average, below average? What programs are being offered to what part or parts of the organization? At each level in the company, what is the right mix of programs? Compensation strategy provides a road map. If you don’t know where you are going, how do you know when you get there? What road to take? It sounds both obvious and somewhat corny, but an organization needs to know where it wants to go in order to plan effective routes, monitor progress, and know when it has arrived. Compensation features cannot be effective without reference to desired outcomes. How does the organization know if it’s is spending the right amounts, to get the desired results? Compensation strategy focuses on both what is to accomplished and how it will be accomplished. Next month’s eNewsletter will address developing a compensation strategy.